Adhesive such as JB Weld Cold Weld Epoxy (for attaching the vine). While studying prehistoric art I asked my students to each bring in their own medium-sized flat rock. After viewing images from Lascaux and Altamira, we also looked at typical symbols of animals & hunters drawn by cave artists. Using pastel chalks (similar to earth pigments--earth tones only) the students were to draw an image/ or images onto their rock. Afterwards we "framed" these with intertwined vine (honeysuckle, or grape vine). The art then is displayed for non-art students to see along with a brief overview of prehistoric art. This project enhanced the lecture & the students really enjoyed it--even the ones that thought they "couldn't draw". One of the nice things about this project is that if you have a limited budget & large classes this is VERY inexpensive! Students can color or paint on brown Kraft Paper . They can color on individual pieces or create a mural as a class. See image at right for student example. Lascaux: Movement, Space and Time - This book includes 262 color illustrations of the most important of the 1,963 images in the cave, including 915 animals and one human. The Splendour of Lascaux: Rediscovering the Greatest Treasure of Prehistoric Art - In 1940, four teenagers stumbled across a hole in the hillside overlooking the village of Montignac, France. In the hole were 17,000- year-old paintings that vividly depicted a whole host of animals and figures. The Cave of Altamira - Since the cave is now restricted to protect the paintings, the detailed photographs by Saura Ramos offer an excellent visual experience to armchair visitors. 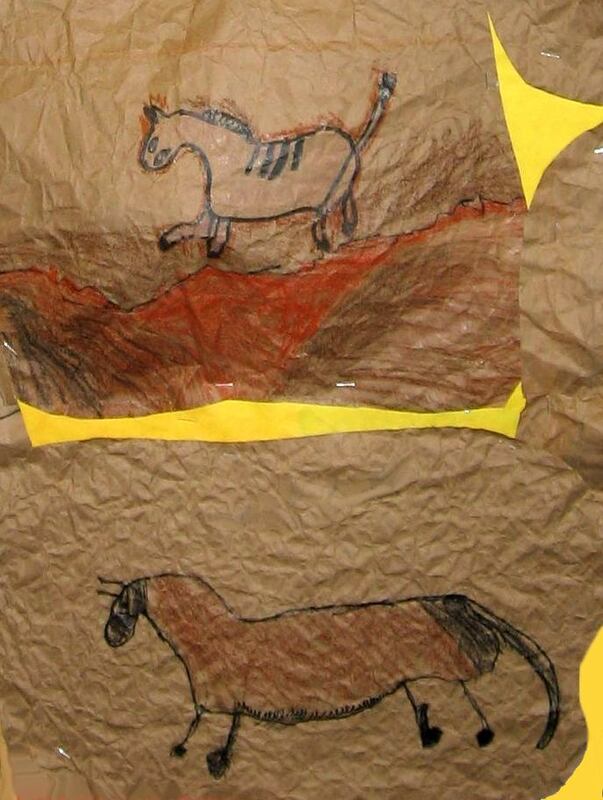 Link: See another Cave Painting lesson.